The West End’s legendary murder mystery drama THE MOUSETRAP is the longest-running show, of any kind, in the world, and is now in its 66th incredible year. 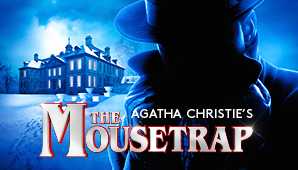 Written by the best-selling novelist of all time (Miss Marple, Poirot) and the ‘Queen of Crime’, Dame Agatha Christie, THE MOUSETRAP has kept audiences guessing for six decades. Now the international production of this whodunit masterpiece comes to New Zealand. Newly opened guesthouse, Monkswell Manor, is snowed in and amongst the seemingly ordinary gathering of guests, a killer lurks... Having already killed once, the murderer strikes again. The tension is razor sharp: everyone is a suspect; everyone a potential victim. One by one the characters reveal their pasts, and a complex web of deceit and suspicion emerges. But who will be next, and who is the killer? If you have special seating requirements such as wheelchair access, hearing difficulties or you require companion seating please contact the Isaac Theatre Royal Box Office on 03 260 5260 Mon – Fri 10am–5pm. Please note: This line is ONLY for special seating. For all other enquiries or help, please call 0800 TICKETEK.